Washington, DC - August 11, 2006 - The National Transportation Safety Board (NTSB) this week released full transcripts of the air traffic control recordings from the four flights hijacked on September 11, 2001, and meticulous Flight Path Studies for three of the flights, in response to a Freedom of Information request by the National Security Archive. The studies provide the most detailed technical information available to date related to the hijackings, and the transcripts of the aircraft-to-ground communications are the first complete government disclosure of each flight's air traffic control recordings. The documents are cited extensively in the 9/11 Commission Report to establish key facts and basic timelines for each hijacked flight. The NTSB Web site references the documents but does not provide copies, claiming "the terrorist attacks of September 11, 2001 are under the jurisdiction of the Federal Bureau of Investigation. The Safety Board provided requested technical assistance to the FBI, and any material generated by the NTSB is under the control of the FBI. The Safety Board does not plan to issue a report or open a public docket." The documents were released in their entirety to the National Security Archive and were received directly from the NTSB. The transcripts provide additional details to the information summarized in the 9/11 Commission Report. For example, the NTSB transcript differs slightly from the Commission's text of the warning that United Airlines Flight 93 received only minutes before the hijackers attacked. At 9:23am, the Aircraft Communications Addressing and Reporting System (ACARS) shows a text message to Flight 93 reading: "BEWARE OF ANY COCKPIT INTROUSION [sic]. TWO AIRCRAFT IN NY, HIT TRADE CNTER BUILDS [sic]." Five minutes later at 9:28am Flight 93 was sending the message "***(mayday)*** (hey get out of here) ***" as it was being hijacked. 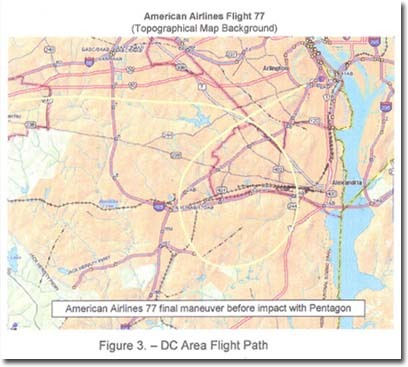 The Flight Path Studies reconstruct the routes of American Airlines Flight 11, American Airlines Flight 77 and United Airlines Flight 175. Complied from recorded radar data and information from the Flight Data Recorders, the studies' illustrations of radar ground tracks, maps and altitude profiles provide graphic guides to each hijacking and were used by the NTSB to determine the takeover points where the hijackers gained control of the planes. In addition to the Flight Path Studies and Air Traffic Control Recording transcripts, the NTSB released a February 2002 "Specialist's Factual Report of Investigation" on United Airlines Flight 93 based on the flight's recovered digital data recorder -- the only surviving recorder from the hijacked planes on 9/11. The report provides graphic analysis of the data recovered from Flight 93 and its subsequent crash in Shanksville, PA. According to the report, the flight recorder functioned normally.